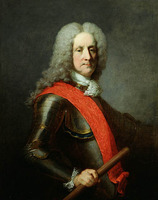 BEAUHARNOIS DE LA CHAUSSAYE, FRANÇOIS DE, Baron de BEAUVILLE, financial commissary, intendant of New France, intendant of the Marine at Rochefort; baptized 19 Sept. 1665 in the parish of Saint- Laurent-des-Orgerils, Orléans, France, eldest son of François de Beauharnois de La Boische and Marguerite-Françoise Pyvart (Pinard) de Chastullé; d. 9 Sept. 1746 at Orléans. The name Beauharnois, which was to become Beauharnais, acquired fame at the time of Napoleon, but the family had had a favourable reputation since the 14th century, particularly in the magistrature and administration. It had made brilliant marriages, such as that in 1605 between Anne de Beauharnois and Paul Phélypeaux de Pontchartrain. Towards the middle of the century the family began to turn towards the marine and the colonies; it supplied many colonial officials and naval officers and established further links through marriages; when Jeanne-Élisabeth de Beauharnois de La Boische, François’s sister, married Michel Bégon de La Picardière in 1711, she entered a family which had undergone an evolution similar to that of her own. Such family groups, veritable administrative clans, profited to the utmost from their relationship with the ministers; New France in the 18th century became familiar with the practice through the Bégons and the Beauharnois. On 2 March 1691, François de Beauharnois had married Anne, the only daughter of François Desgrez and Anne Hugot. The dowry of 60,000 livres did not include any cash but a house worth 23,000 livres and Paris municipal bonds. When the Desgrez couple died in 1705, they left a fortune of 70,000 livres. 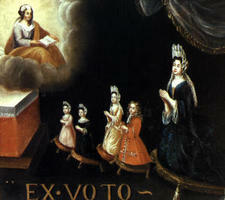 Anne Desgrez, who died on 24 Sept. 1731, had no children by Beauharnois. She was not with him when he was in New France or serving in the ports of the mother country. Beauharnois, who landed at Quebec as intendant on 29 Aug. 1702, was the protégé of the minister of Marine, Jérôme Phélypeaux, Comte de Pontchartrain; the latter had preferred him to M. de Villeboix, whom the priests of the Séminaire des Missions Étrangères in Paris wanted to send; “he is related to the minister by marriage,” wrote Henri-Jean Tremblay, “and no one dares say anything.” Pontchartrain, moreover, made no secret of it, since after Philippe de Rigaud* de Vaudreuil was appointed governor he wrote to him: “I hope that you will be further encouraged [to get along well with him] not only because of his good manners, but also because of the interest that I take in him.” Was the minister thinking of promotion for him? It is possible. Perhaps he simply wanted to prepare François for succeeding Michel Bégon de La Picardière the elder in the important intendancy of Rochefort, where the experience François had already acquired as commissary of the Marine (at Toulon 1692–94, Rochefort 1694–95, Le Havre 1695–97, and Brest 1697–1702) and would acquire in the colonies would be of great value to him. The New France that Pontchartrain was entrusting to Beauharnois as a means of proving his ability was, however, still only a small province, where in that very year 1702 the only important business, the fur trade, was in inextricable difficulties. As if to add to the confusion, war had just been declared between France and England. The new arrival’s task was not the easiest. According to the terms of his commission the intendant was first of all a judge, and as such his chief duty was to preside over the weekly meeting of the Conseil Supérieur. During Beauharnois’s stay few important matters came to upset the council’s routine. He got along well with the councillors and hastened to support their request for a salary increase. Similarly he recognized the necessity of providing a good legal library for these men who had little knowledge of the law. It was the “police” aspect of this role, however, that engrossed his attention the most. In this area, a large one, his activity was unfortunately not always beneficial to the colony. On the council his only quarrel was with the attorney general, François-Madeleine-Fortuné Ruette* d’Auteuil, a turbulent and rather sly person. Beauharnois had to recognize in 1704 that the accusation of smuggling he made against d’Auteuil in 1702 was unfounded. 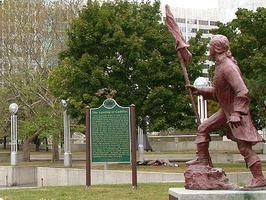 Yet Beauharnois also had to maintain his rights; he succeeded in doing so against an upstart profiteer connected with Ruette, Lamothe Cadillac [Laumet*], who, having established himself at Detroit, refused to recognize the authority of governor and intendant. 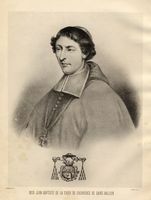 In religious matters he gave complete satisfaction to the whole clergy, bearing out Tremblay’s optimistic forecasts about him, but he refused a request from Bishop Saint-Vallier [La Croix*] to raise the tithe from one twenty-sixth to one thirteenth. In the important and delicate question of setting food prices he brought upon himself accusations which were not unfounded, it seems. The meticulous regulation of the sale of beef which he introduced in August 1703 probably did not profit him, but it was the opposite with the wheat he sold “for the sustenance of the troops and the settlers” at three livres a bushel after paying 40 sols or less for it. Ruette d’Auteuil’s testimony just quoted would be greatly suspect were it not for another source showing that Beauharnois was simultaneously speculating in salt. “He had it [the salt supply] allocated to two merchants,” Tremblay wrote in 1705, “at 1 écu a bushel and sold it under their name for 15 or 16 livres. That was the audible rumour in the offices this year.” Such speculation had also caused rather considerable “feeling” among the people of Montreal. There is every reason to believe that the mildness with which Vaudreuil repressed the rioters – and for which the court blamed him – was above all motivated by the part the intendant had had in causing the disturbance. A considerable share of the profits was also probably put aside for him in the sale of goods which his brother, Charles de Beauharnois, commanding the king’s ship, brought in his cargo in 1703. But this operation was not continued and so there was little talk of it in the colony, especially since Beauharnois’s main accuser, Ruette d’Auteuil (particularly in his report in 1712), was completely discredited shortly after. In the execution of his economic plans, which were in fact fairly modest, the intendant encountered serious difficulties. The transport to France of wood – particularly for masts – was hampered by a shortage of suitable ships, which was worsened by the war. The growing of flax and hemp was promising; the intendant urged the settlers to cultivate them, and the crops were good, but the minister of Marine refused categorically to send weavers; the colony must not harm the industries in the mother country. As an encouragement to fishing, Beauharnois succeeded in obtaining a few hundred livres from the authorities – too little to ensure the prosperity of such a difficult and dangerous industry. The great concern of his administration, however, even to the point of preoccupation, was the growing deficit of the Compagnie de la Colonie. Since 1700 the Canadians had been directing the trade in beaver pelts themselves. The court, which was expecting a great deal from this new company, had asked Beauharnois to encourage as many Canadians as possible to take part in it. On his arrival, however, Beauharnois noted that the shareholders were poor and unenthusiastic; he soon learned the reason when he read through the report which Denis Riverin*, the company’s representative in France, presented in 1702: in two years the company had contracted debts of nearly 1,000,000 livres and found itself forced to borrow 700,000 livres more in order to meet its “pressing needs.” The revenues anticipated in the immediate future fell far short of this enormous total. Beauharnois applied himself to discovering the causes of the difficulties; he saw two: first, the “small revenue from the king’s tax farm,” resulting from discontinuation by Versailles of the fur-trading licences because of an excess of beaver pelts; second “the excessive expenditures the directors have made, both from running their trading posts and for management expenses.” Since the directors were “without money or credit,” he had had to lend them the money necessary to pay “the expenses borne by the king’s estate,” which they had undertaken to meet in exchange for their privileges. The minister had had much trouble in replacing the mercantile agents in Paris, who had withdrawn because of the absence of large profits, and he was angry at the Canadians’ attitude: “The capital of this company is in reality a creation of the mind. No one has put a sol in it, and the private individuals only went into the partnership in the hope of sharing future profits.” He announced tight restrictive measures against the company, limiting its production to “80 thousand dry and parchment beaver, excluding greasy beaver.” According to the Canadians the restrictions ran the risk of ruining “all business in this colony.” The directors of the company therefore sent a representative to France in 1704, Antoine Pascaud*, the choice being practically dictated by Beauharnois, to plead their cause with the minister. The intendant had to admit to the latter that the company’s papers were badly kept; in fact; they were in complete disorder. He was once again obliged to advance the company the funds it needed to pay the “expenses borne by the king’s estate”; in the autumn of 1704 he had to have “54,000 livres drawn in France in bills of exchange equivalent to two-thirds of the said estate [of the king] and . . . playing-card money made at the king’s discretion . . . to pay off the remaining third of the said estate.” This playing-card money was not sufficient; the intendant had to create more to finance the expedition the company had had to send to Hudson Bay. The minister protested; Beauharnois had made a great mistake in being so accommodating towards the Canadians. All his measures were vigorously criticized. Eventually the task of applying the necessary remedies and finally of liquidating the company – which was carried out in 1706 – was entrusted to Jacques Raudot*, Beauharnois’s successor. The financial role of the intendancy constituted the third of Beauharnois’s tasks. In New France at the beginning of the 18th century there was a chronic deficit; to remedy it, the intendant had no other recourse but expedients; and, either through the irony of fate or by unavoidable mischance, the measures he took were always those the minister had forbidden. Thus in place of the defaulting company Beauharnois had paid the expenses of the king’s domain; in the autumn of 1705 this loan amounted to nearly 200,000 livres. But to the minister this debt owed to the king by the company ought to have been avoided. The ordinary revenues of the colony were increased by the proceeds of the sale of goods deposited in the king’s warehouses; in 1705 profits from them were said to have amounted to more than 50,000 livres. But there was a drop in profits in certain years for which two explanations may be offered: it is possible Beauharnois deducted a share in advance as personal profits; and when the king’s ship did not arrive, as in 1704, only limited quantities of goods were sold. The main source of the colony’s funds continued to be, in spite of all efforts, “the money that is sent from France,” on the king’s ship. At the beginning of the 18th century this amounted to a little more than 300,000 livres a year. These annual remittances from the treasurer general of the Marine were systematically lower – by 87,000 livres in 1705 – than the estimates of the intendant, to whom the minister gave strict injunctions to reduce expenses. To settle accounts, therefore, it was necessary to issue bills of exchange and, inevitably, playing-card money. On this subject it should be noted that, faithful to the minister’s orders, Beauharnois had refused in 1702 the 60,000 livres in playing-card money that governor Louis-Hector de Callière* demanded to “advance the fortifications.” But in 1703 he had to give in, for questions of security were involved; indeed, there could be no further delay in “providing for the expenses of the fortifications and other supplementary war expenses.” Pontchartrain was angered: “His Majesty has considered that it was unwise to restore playing-card money”; in only one situation would there be justification for making it, if the funds that had been granted were not received – exactly what happened in 1704. The vicious circle of inflation reappeared; in 1705 the cards were already beginning to be devalued. François de Beauharnois remained barely three winters in Canada, leaving the colony in the autumn of 1705; he had perhaps not had time to show his capabilities fully. Above all he appears a practical man, a man of action, much more than a thinker. Certainly he was not lacking in intelligence, but he left no systematic report on the colony nor any brilliant or original views in his correspondence. He was, on the other hand, diplomatic and conciliatory, without being fooled by the turbulent elements in the colony, whose measure he took reasonably well. Contrary to what often took place, Beauharnois’s relations with his immediate superior, the governor general, were good; at least the available documents do not report any striking altercation, any serious clash. Perhaps the reason lies in the intendant’s pleasant character and the brevity of his stay in Canada. But it also seems that Vaudreuil, a good politician, had taken seriously the warning the minister had given him to treat his cousin and protégé with respect. Besides, the two administrators may have been linked by common interests in the fur trade and commerce in Canada. In the constant dilemma which administrators in Canada faced – whether to obey the minister’s orders and make the population unhappy or to answer the people’s needs and oppose the minister’s directives if necessary – Beauharnois almost always chose the second policy. One has the impression that he was assured of immunity in high places. The harsh reproaches he received from the minister were not the cause of his recall and did not prevent him from pursuing his career in complete security, even after his protector’s disgrace. On his return to France Beauharnois held the office of intendant of the naval forces until 1710, when he was appointed intendant of the contingents enrolled for naval service. But he may never have actually exercised this function, for on 24 March 1710 he was appointed intendant of the Marine at Rochefort and was put in charge at the same time of the intendancy of the generality of La Rochelle. Now began his real career, which was to last 28 years. Unfortunately it has not yet been the subject of any full study, and only a few landmarks in it can be given here. 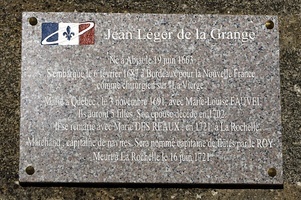 The task before Beauharnois was not the easiest: he was taking the place of an exceptional man, Michel Bégon, who by his authority and prestige had succeeded in maintaining good feeling among the population. Beauharnois was too complaisant with the naval officers, thus provoking some rather serious incidents. He also had to deal with the stagnation which the arrival of peace in 1713 brought to the port of Rochefort; the shipbuilding yards were almost idle and the arsenal was reduced to virtually nothing. Beauharnois was still concerned with Canada, since nearly all supplies and other help destined for that colony left from Rochefort. He tried to remedy the inactivity and paid particular attention to assisting the poor. He also took an interest in the schools of anatomy and surgery which were founded around 1720 and depended upon the naval hospital. The port did not begin to prosper until after a visit made by the minister of Marine in 1727. Beauharnois seems to have carried out his duties honestly and conscientiously. François de Beauharnois appears not to have had any financial difficulties; he was not able to enter into his inheritance until after his mother’s death in 1721, but his marriage had been, at least financially, a fortunate one. Moreover, the various offices he held had provided him with many opportunities to make a fortune, and he had not let them go by, if we may believe his contemporaries. At his death he had a tidy fortune: 6,000 livres in movables, which was respectable without being luxurious; more interesting is the fact that his silverware was valued at 18,000 livres; still more remarkable, he had in his home 63,000 livres in cash, to which was added at the time of the inventory 16,000 livres owing in gratuities from the king or salary unpaid at his death. Debts due him amounted to 65,000 livres and there was no mention of any liabilities. Thus there were assets of 168,000 livres, to which must be added the land and château of La Chaussaye and the numerous pieces of land that he leased around Orléans. François de Beauharnois was above all a man of the world; he was said to be “witty” and to have “liked his pleasure,” but he was not wanting in a taste for letters. His library gives some indication of this taste: it included 87 titles, comprising 195 volumes, among which history and architecture predominated; there was also an interesting collection of prints and maps. His mind seems to have been open and curious; he owned the 1697 edition of Pierre Bayle’s Dictionnaire historique et critique and several current publications, among them the 1731 edition of Louis Moreri’s Grand dictionnaire historique. He lived simply in the midst of these riches: his home was richly furnished but was far from lavish. He owned a collection of 19 “family paintings” and a finely decorated private chapel in which the bishop of Orléans had given him permission to have mass said. The Beauharnois were not indifferent to religion: François’s mother had been a patroness of the Oratory in Orléans, and he himself asked in his will that on his tombstone be inscribed “Hic jacet Beauharnois peccator” (Here lies the sinner Beauharnois). AD, Loiret (Orléans), État civil, Saint-Laurent des Orgerils; Greffe de Poullain, 3 juin 1694, 27 août 1700, 23 mai 1721, 7 oct. 1746, 1er sept. 1747. AN, Col., B, 25, p.181; C11A, 20, pp.106ff., 124ff. ; 22, pp.11ff., 68, 172–73; E, 22, pièce 8 (PAC transcripts); Marine, E, 1, ff.339ff. ASQ, Lettres, N, 117, p.13; 123, p.17; O, 36, p.23. “Correspondance de Vaudreuil,” APQ Rapport, 1938–39, 62, 84, 116. Édits ord., II, 318. “Lettres et mémoires de François-Madeleine-Fortuné Ruette d’Auteuil, procureur général au Conseil souverain de la Nouvelle-France,” APQ Rapport, 1922–23, 42. Le Jeune, Dictionnaire. Frégault, Le XVIIIe siècle canadien, 242ff., 289ff., passim. 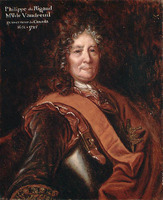 Jacques Simard, “Un intendant au Canada, François de Beauharnois, 1702–1705” (unpublished ma thesis, University of Ottawa, 1967). J.-T. Viaud et E.-J. Fleury, Histoire de la ville et du port de Rochefort (2v., Rochefort, 1845). 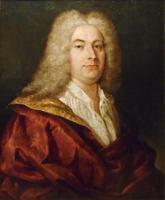 Jean-Claude Dubé, “BEAUHARNOIS DE LA CHAUSSAYE, FRANÇOIS DE, Baron de BEAUVILLE,” in Dictionary of Canadian Biography, vol. 3, University of Toronto/Université Laval, 2003–, accessed April 22, 2019, http://www.biographi.ca/en/bio/beauharnois_de_la_chaussaye_francois_de_3E.html.